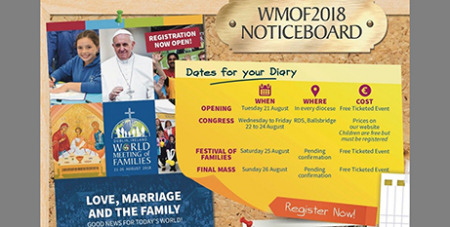 Organisers for the World Meeting of Families in Ireland say excitement is growing ahead of Pope Francis’ visit to the gathering next month with all tickets to papal events now booked out. Source: Vatican News. Brenda Drumm, Media Director of the World Meeting of Families (WMOF), says that for many people Pope Francis “has become the Pope of the family” and this helps explain why all tickets have been booked out for the WMOF events, including half a million tickets made available for the closing Papal Mass in Dublin's Phoenix Park. In an interview with Vatican News, Ms Drumm said “anticipation and excitement is growing” in Dublin in the run-up to the August 21-26 meeting, and is part and parcel of the steady momentum that began to build up after the announcement that Pope Francis would be attending the meeting's final two days. Ms Drumm said many Catholics like what the Pope is already saying about family issues and his message resonates strongly with them, whether they are old or young. “I think for a lot of people he has become the Pope of the Family ... they like his style, they like his message," she said. "He gets family life"
Ms Drumm said the Irish people also can see and appreciate that Pope Francis has a clear understanding about the daily realities of family life with all its ups and downs. “He gets family life … the joys but also the challenges … that sometimes plates can fly and children bring headaches," she said.